Applauded for its modern design, comfortable amenities, and exceptional cleanliness, Czech Inn is consistently one of Prague’s best-rated properties. Housed in a beautifully restored 19th century building, Czech Inn offers a variety of rooms to suit travelers needs. The in-house bar serves breakfast, light snacks, and drinks and is a great place to meet fellow travelers and locals alike. 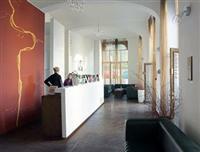 Located close to city center, and on one of the best tram routes of the city, it’s an ideal base to explore Prague. Plus, with great restaurants and shops around the corner, it takes convenience to another level. There’s much to see and experience right outside the front door! Our staff will be more than happy to guide you to the main sights in Prague like Old Town Square, Charles Bridge, and Prague Castle, or recommend some lesser known places of interest. Czech Inn is a smoke-free environment.